FOOD, BEER, 4ftMINI, PRIZES, MUSAC and lots o’ people. 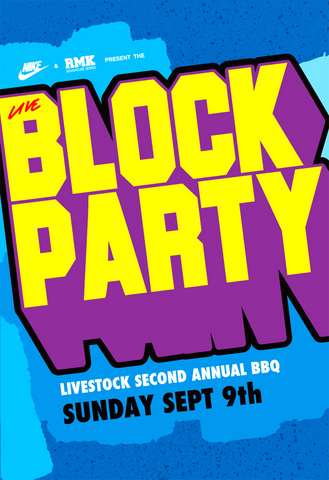 Huge line-up for this legendary Livestock Block Party. Catered by Guu, 4 foot mini-ramp, beer garden and prizes and limited releases by Stussy, Vans, Puma, Adidas, eS Footwear, Brknhome, Nike, The Hundreds and RMK. Shouts also to Knowshow, Infamous and Color Magazine.